Danelectro Leader Model Tube Amplifier (1951), made in Red Bank, NJ, brown fabric covering finish. Height is 16 in. (40.6 cm. ), 15 1/2 in. (39.4 cm.) width, and 8 1/4 in. (21 cm.) deep. 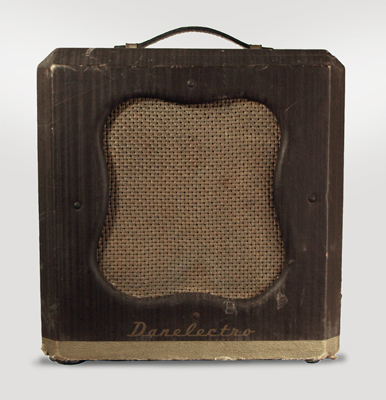 A good gigging example of a very early Danno amp. There has been a lot of internal work done (pretty much a total recap; the old parts are included) and one newer transformer. The covering is a bit dirty with some small tears and scuffing but mostly intact. The knobs are proper period but mismatched. A nice old set of American tubes and the original speaker remain; this is a snarly little amp with "just the right amount of funk." Very Good + Condition.